Safely moves fixed sights right or left in their dovetails without deforming slide or sight. Specifically designed for use with factory and aftermarket Tritium night sights, which are too fragile for the traditional hammer-and-punch sight installation method; works equally well with iron sights. Thumbscrew securely locks the slide so it’s fully supported in the rigid, machined aluminum body. Separate slots in the screw mechanism engage the sight and firmly, yet gently, concentrate screw force to loosen sights from even extremely tight dovetails. Hardened steel handle provides plenty of leverage, while self-lubricating, oil-impregnated Oilite® bronze bearings and extra-fine threads ensure smooth, precise movement. Beretta/Glock fit rear sights only. Glock Flat-Side fits aftermarket rear sights with straight, non-sloped sides for standard- and large-frame Glock pistols. SIG fits rear sights on all SIGs except SIG-PRO. Smith & Wesson M&P fits both and front and rear sights; will not fit Pro models with 5" barrel. Will not fit the Shield model. Smith & Wesson M&P Shield now fits 9,40, & 45 models. Springfield XD fits both front and rear sights on all XD models except front sight on 5" barrel Tactical model. These do not work on the front sights of Pro/Tactical or sub compact XD/XDM model front sights. Will not work on XD-S slides. 1911 will not work with most Kimber slide/sight combinations. Only works on rear sights. Not for installing or adjusting front sights. Sig fits P220, P225, P226, P228, P239 only. Does not fit Sig Pro series. Does not fit P220 Elite Shadow. Does not work on adjustable sights. SPECS: Aluminum body, anodized. Steel cross carriage bolt and thumbscrew, black oxide finish. Beretta/Glock - 4¾” (12.1cm) wide, 3” (7.6cm) high, ¾” (19mm) thick. Glock Flat Side - 4¾" (12.1cm) wide, 2½" (6.4cm) high, 1¼" (3.2cm) thick. SIG - 4¾” wide, 5” (12.7cm) high, 1” (2.5cm) thick. Smith & Wesson M&P and Springfield XD - 4¾” (12.1cm) wide, 3-5⁄8" (9.2cm) high, 1-5⁄8" (4.1cm) thick; fits front and rear sights. M&P will not fit Pro models with 5" barrel. 1911 will not work with most Kimber slide/sight combinations. Faster and easier than using a punch and hammer to install Heinie sights on Glock slides. Easy to Use and Veru useful for installing and adjusting Beretta 92 sights. The sight pusher works great for the factory rear sight on the 92/M(. however it doesnt work with the adjustable sights on the Practice kit. The sight does not fight inside the "pusher area". i had to disassemble the sight to make it work. The tool will remove factory sights on a 92FS, however if you want to install adjustable sights you will have to dismantle the sight for it to work. The sight pusher Block will not move out of the way far enough to remove your slide from the tool mount. If the slide locking screw was 1/4 inch shorter it may work, or if the pusher block could move 1/4 inch further left or right, it would be perfect. The tool I received out of the box binds a bit as you move the sight pusher block left or right as if the guide rod was slightly off true or bent. The tool worked fine to remove the old sight from my 96, but the new adjustable sight was to wide and I could not remove the slide from the tool once the sight was installed. I was forced to move the sight half way back out so I could remove the slide and then finnish the job with a punch and hammer. If the tool was a 1/4 inch wider to allow the clearence it would be perfect. Tool worked fine to remove the old sight from my 92A1. The new adjustable sight is too wide and wont fit in the adjustment tool. I ended up having to use a punch and hammer. If the tool was wider it would work. I bought this sight mover along with adjustable target sights. Used it on a 96A1 and 92FS. This device works great on standard sights, but is not compatible with adjustable target sights. Needs a redesign to be worth buying. It works even better than the Glock factory sight adjustment tool since it fits all the guns and you don't need separate tools for the small frame and large frame pistols. Very easy to set up and use. Easily the best tool to use for moving Glock rear sights. I have used this pusher on 3 different model Glocks, 21sf, 26, and 34. It is well worth the money. Bought this to install Heinie straight 8's on a Glock 22 duty pistol. It almost took longer to read the one page instruction sheet than it did to remove the old Tru Dots and install the new Heinies. Considering I probably would have broken the tritium tube trying to pound the rears on with a drift, I'm glad I finally broke down and bought this pusher. This tool is so awsome. I used it to install Glock Adjustable Rear Sights and Truglo TG131GT1 Rear Sight. Very easy to do. 100% recommended and well built piece of equipment. Should last my lifetime and many others. Just replaced three rear sights on my Glocks. Two .40s and one 45 this is the easiest tool to use and it couldn't have worked better. I know it only works on Glocks, but who wants to shoot anything else. This tool is cheap and works on all Glocks, get it. 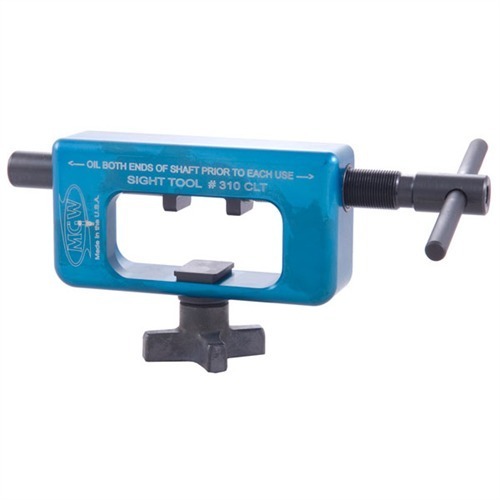 I am listing my Universal tool on [...] because this one is so good. If you own Glocks, installing after market tritium sights is probable one of the first mods you will make. For the price of what a you pay for this tool you can get a gum smith to do it. If you do one more, it has paid for itself. Don't take the chance on using a hammer and punch! You do not want to punch in a radioactive sight. BTW, this tool also works on Sigs. They just get pushed or pulled out the other way. The tool is well made and more massive than the picture shows. Large, sturdy, well made and it works perfectly. I received it last night, and a set of Heinie 3D night sights for a G17. I had the old rear sight off and the new one on in minutes. If your a Glock user or armorer this is a great tool. I recommend it because it works well. No problems. I have performed many sight jobs with this tool now. It works great, pushing or pulling on Glocks. Great heavy duty sight pusher worth every penny. used on my glocks and did a little dremeling for it to fit the 30/21/20 rear sites. I just wish they would make a more universal tool that would do more then one brand of pistol. This tool worked like it was suppose too. Although it ruined the factory plastic sight it installed the night sight without a problem. I've been putting off and making do without this sight pusher for a long time. It costs about the price of a good set of sights, which can be ruined and scratched by the traditional hammer and punch method especially the tritium ones. I have 3 glocks. It pays for itself in just a couple times it's used vs. paying someone. I used mine at the range to make final sight adjustments right there on the bench.... the fine threaded screw on this tool makes adjustments a breeze. dont buy the lousy cheap ones you see elsewhere, this is the only one you need. Only downside is that one model is made to do one type of sight.... but it does the job perfectly. If you dont want to make new friends, then hide this pusher and dont let anyone see you using it, else you are going to make a lot of friends. They remember, believe me !! I used the MGW309 on a Gen 1, Glock 19, installing a MeproLight TruDot sight. The 309 is the tool desginated for sights with sloped sides (as opposed to the straight sided sights). I have yet to take the pistol and tool to the range, but based on my experience of the initial installation, adjustment at the range will not be an issue. My only issue - which did not reduce my rating - was the instruction about clamping the pistol's slide into the tool. The tool's plate slides into the back of the pistol's slide the same way the pistol's receiver would. This makes for a very stable slide to tool attachment. I chose this tool and sight because my wife's carry Glock has the same sights and I wanted to stay consistent. I am not a gunsmith, but I felt no uncertainty about taking on the task having seen it performed one time at a gunshop. I'm a certified Glock armorer and have used one of these on all my Glocks using mostly Meprolight night and Tru-Dot adjustable, and TFO sights. I prefer it over factory sight tool. this sight tool is built rock solid. be sure to order the correct one, Flat or angled depending on what type of sights you use. I've tries several Glock Sight adjustment tools and the MGW's are BY FAR the best. Don't bother with anything else. I have used this tool to remove the factory plastic rear sights and install factory tritium rear sights on 4 Gen 4 Glocks including the Model 21. There were no problems. The plastic rear sights were not damaged and could be reinstalled. No damage to the sights, slide or pusher. Nice smooth feel after a drop of Breakfree to the threads. Very well-made product. Built to last. Works smoothly. WAY better than the ones Glock has made!!! The sight mover does move Glock sights. It would be a better tool if the portion that pushes the sight sat lower, closer to the sight when the frame is inserted into the tool. As it there is a tendency to put downward pressue on the sight, instead of straight across which would be much better which is why I rated the tool as only average. The sight itself seems to be well made, and hopefully it will last a long time. I would hesitate to recommend to a friend without more research to see if there are better designed tools available. Put new sights on my glock 19 also pushed the old glock plastic sights off.This tool is top of the line should last my livetime. The slide was a little snug inserting into the tool, but not what I would consider difficult or out of the ordinary. The sight came out with very little difficulty, but the finish was stripped from the top of the slide. Not real happy about that, hence the 2 stars. I took out the shim from the tool for enough clearance to install the new sight. Well built, robust, and Great product! It came today and i was able to change out my factory sights for trijicon HDs in 5 mins. Initially i tried using a padded vice and nylon punch which did the trick to get the factory sights off, but wasnt effective to install my HDs. I would recommend covering the side of your new sights that come into contact with the pusher with electric tape or something else to prevent scratching the sights. If you have multiple glocks this product pays for itself, but if you only have one, a gunsmith might be more cost effective. The product lacks versatility. This will only work for glocks using the factory profile sights eg meprolights, HDs, etc. wont work for straight sights eg heinie, warren etc. Bought this to install Trijicon HD sights. This tool worked excellent, even though rear sight was tight. If I had to use a hammer and punch it would have marred up the rear sight. I would highly recommend this product. I wish I owned it years ago. No more paying a gunsmith to install your sights and have a professional look. You can also adjust the rear sights for POI also. Very well done MGW. Had a gift certificate and used it on this item. After installing 3 pairs of sights on a 19,26, and 43, I can tell you it is well worth it. Rear sight removal and install was done without a hitch on all three Glocks (had the adapter for the 43). Though not a gunsmith per se with five Glocks I thought it time to enable myself to do sight work on them rather than have others do it. Chose this tool over others after searching all over for reviews and comments. After reading and re-reading the one paragraph instructions and using utmost care I did two rear sights within about fifteen minutes. One was on my twenty year old (as of last month) Glock 26 which I figured would be a good test case. No muss, no damage, nothing but perfection. As long as you have clearance and the sight keeps moving while you're turning the handle I don't see how you can damage the sight or slide. Note: The instructions do say if you can't turn the handle stop or you can damage the tool, sight, or slide since obviously the sight is basically frozen in the dovetail. Night sights on my new Glock 19 was a snap. Both required the provided shim to ensure proper clearance. Limited function since this model is designed only for angled sights but face it, this is a specialty tool. Obviously well machined and built to last forever. Take you time, make sure you have assembled the slide into the tool correctly and I don't see how you can go wrong. This tool is very useful and is a great investment. I have replaced factory sights and old burned out Trijicon sights in both medium and large frame Glocks. I also helped install my friends sights. It is easy to use and well made. First of all, Brownells has super fast shipping! This is like Amazon Prime for gun parts! This tool is so easy to use. Simply mount the slide and crank. Great quality tool and functions just as described. I'll be using this tool a lot! Unless the sight is very loose in the dovetail, this cannot move the sight for any kind of fine adjustment. A better option is a nylon tipped punch. This thing is a waste of time. I have had one of these for years and it makes rear sight installation and adjustment a snap. If you just need to do one installation on a 1911 style gun, it might be overkill. But it makes installation and fine adjustment much easier than with a punch, and worth it if you do adjustments, installations, or sight changes routinely. Unlike the SIG version, this model will not work on front dovetailed sights and is very limited in it's range of use. Outside of a very tight fitting rear tritium sight that you won't want to use a punch on (they break easily) there is not much use for it. This tool is not the one I would recommend for the casual user, it is very specialized. For certain gun/sight combinations it is the BEST I have used. If you are moving really tight sights on 1911's, or installing Tritium sights on a regular basis this is a got-to-have tool. tried to use on a new combat commander. sight mover not nearly close enough to put pressure on sight. can not be used on the front sight. Časť - Výrobcovia: MGW310 Bezpečne premiestni pevnú pamiatok vpravo alebo vľavo v ich firmu bez deformácii snímky alebo pohľad. Špeciálne navrhnutý pre použitie s factory a následnom trícia nočné pamiatky, ktoré sú príliš krehké na tradičné kladivo a punč pohľad spôsob inštalácie; funguje rovnako dobre s iron zameriavače. Thumbscrew bezpečne uzamkne snímku, tak je plne podporovaná v tuhé, obrábané hliníkové telo. Samostatné prevádzkové intervaly v skrutku mechanizmus zapojiť zrak a pevne, ale jemne, sústrediť skrutku sily k uvoľneniu pamiatok od aj extrémne tesný firmu. Kalenej ocele rukoväť poskytuje dostatok pákového efektu, zatiaľ čo já-mazacie, olejom impregnovaný Oilite® bronzové ložiská a extra jemné vlákna zabezpečiť hladké a presné pohybu. Beretta/Glock fit len zadné mieridlá. Glock byt strane zapadá aftermarket zadné mieridlá s rovnou a non-sloped stranách pre štandard - a veľké-rám pištole Glock. SIG vojde zadné mieridlá na všetky SIGs okrem SIG-PRO. Smith & Wesson M & P hodí oboch a predné a zadné zameriavače; nebude fit Pro modely s 5" barel. Nebude fit model štít. Smith & Wesson M & P štít teraz hodí 9,40 & 45 modelov. Springfield XD hodí predné a zadné zameriavače na vöetk˝ch XD okrem muška na 5" barel taktické model. Tieto práce na mušky Pro/taktické ani sub kompaktný model XD/XDM mušky. Nefunguje XD-S snímok. 1911 nebude fungovať väčšina Kimber slide/pohľad kombináciami. Funguje len na zadné mieridlá. Nie za inštaláciu alebo nastavenie mušky. SIG hodí P220, P225, P226, P228, iba P239. Nezapadá Sig Pro series. Nezapadá P220 Elite tieň. Nefunguje na nastaviteľnými mieridlami. Časť - Výrobcovia: MGW309 Bezpečne premiestni pevnú pamiatok vpravo alebo vľavo v ich firmu bez deformácii snímky alebo pohľad. Špeciálne navrhnutý pre použitie s factory a následnom trícia nočné pamiatky, ktoré sú príliš krehké na tradičné kladivo a punč pohľad spôsob inštalácie; funguje rovnako dobre s iron zameriavače. Thumbscrew bezpečne uzamkne snímku, tak je plne podporovaná v tuhé, obrábané hliníkové telo. Samostatné prevádzkové intervaly v skrutku mechanizmus zapojiť zrak a pevne, ale jemne, sústrediť skrutku sily k uvoľneniu pamiatok od aj extrémne tesný firmu. Kalenej ocele rukoväť poskytuje dostatok pákového efektu, zatiaľ čo já-mazacie, olejom impregnovaný Oilite® bronzové ložiská a extra jemné vlákna zabezpečiť hladké a presné pohybu. Beretta/Glock fit len zadné mieridlá. Glock byt strane zapadá aftermarket zadné mieridlá s rovnou a non-sloped stranách pre štandard - a veľké-rám pištole Glock. SIG vojde zadné mieridlá na všetky SIGs okrem SIG-PRO. Smith & Wesson M & P hodí oboch a predné a zadné zameriavače; nebude fit Pro modely s 5" barel. Nebude fit model štít. Smith & Wesson M & P štít teraz hodí 9,40 & 45 modelov. Springfield XD hodí predné a zadné zameriavače na vöetk˝ch XD okrem muška na 5" barel taktické model. Tieto práce na mušky Pro/taktické ani sub kompaktný model XD/XDM mušky. Nefunguje XD-S snímok. 1911 nebude fungovať väčšina Kimber slide/pohľad kombináciami. Funguje len na zadné mieridlá. Nie za inštaláciu alebo nastavenie mušky. SIG hodí P220, P225, P226, P228, iba P239. Nezapadá Sig Pro series. Nezapadá P220 Elite tieň. Nefunguje na nastaviteľnými mieridlami. Časť - Výrobcovia: MGW308 Bezpečne premiestni pevnú pamiatok vpravo alebo vľavo v ich firmu bez deformácii snímky alebo pohľad. Špeciálne navrhnutý pre použitie s factory a následnom trícia nočné pamiatky, ktoré sú príliš krehké na tradičné kladivo a punč pohľad spôsob inštalácie; funguje rovnako dobre s iron zameriavače. Thumbscrew bezpečne uzamkne snímku, tak je plne podporovaná v tuhé, obrábané hliníkové telo. Samostatné prevádzkové intervaly v skrutku mechanizmus zapojiť zrak a pevne, ale jemne, sústrediť skrutku sily k uvoľneniu pamiatok od aj extrémne tesný firmu. Kalenej ocele rukoväť poskytuje dostatok pákového efektu, zatiaľ čo já-mazacie, olejom impregnovaný Oilite® bronzové ložiská a extra jemné vlákna zabezpečiť hladké a presné pohybu. Beretta/Glock fit len zadné mieridlá. Glock byt strane zapadá aftermarket zadné mieridlá s rovnou a non-sloped stranách pre štandard - a veľké-rám pištole Glock. SIG vojde zadné mieridlá na všetky SIGs okrem SIG-PRO. Smith & Wesson M & P hodí oboch a predné a zadné zameriavače; nebude fit Pro modely s 5" barel. Nebude fit model štít. Smith & Wesson M & P štít teraz hodí 9,40 & 45 modelov. Springfield XD hodí predné a zadné zameriavače na vöetk˝ch XD okrem muška na 5" barel taktické model. Tieto práce na mušky Pro/taktické ani sub kompaktný model XD/XDM mušky. Nefunguje XD-S snímok. 1911 nebude fungovať väčšina Kimber slide/pohľad kombináciami. Funguje len na zadné mieridlá. Nie za inštaláciu alebo nastavenie mušky. SIG hodí P220, P225, P226, P228, iba P239. Nezapadá Sig Pro series. Nezapadá P220 Elite tieň. Nefunguje na nastaviteľnými mieridlami. Časť - Výrobcovia: MGW314 Bezpečne premiestni pevnú pamiatok vpravo alebo vľavo v ich firmu bez deformácii snímky alebo pohľad. Špeciálne navrhnutý pre použitie s factory a následnom trícia nočné pamiatky, ktoré sú príliš krehké na tradičné kladivo a punč pohľad spôsob inštalácie; funguje rovnako dobre s iron zameriavače. Thumbscrew bezpečne uzamkne snímku, tak je plne podporovaná v tuhé, obrábané hliníkové telo. Samostatné prevádzkové intervaly v skrutku mechanizmus zapojiť zrak a pevne, ale jemne, sústrediť skrutku sily k uvoľneniu pamiatok od aj extrémne tesný firmu. Kalenej ocele rukoväť poskytuje dostatok pákového efektu, zatiaľ čo já-mazacie, olejom impregnovaný Oilite® bronzové ložiská a extra jemné vlákna zabezpečiť hladké a presné pohybu. Beretta/Glock fit len zadné mieridlá. Glock byt strane zapadá aftermarket zadné mieridlá s rovnou a non-sloped stranách pre štandard - a veľké-rám pištole Glock. SIG vojde zadné mieridlá na všetky SIGs okrem SIG-PRO. Smith & Wesson M & P hodí oboch a predné a zadné zameriavače; nebude fit Pro modely s 5" barel. Nebude fit model štít. Smith & Wesson M & P štít teraz hodí 9,40 & 45 modelov. Springfield XD hodí predné a zadné zameriavače na vöetk˝ch XD okrem muška na 5" barel taktické model. Tieto práce na mušky Pro/taktické ani sub kompaktný model XD/XDM mušky. Nefunguje XD-S snímok. 1911 nebude fungovať väčšina Kimber slide/pohľad kombináciami. Funguje len na zadné mieridlá. Nie za inštaláciu alebo nastavenie mušky. SIG hodí P220, P225, P226, P228, iba P239. Nezapadá Sig Pro series. Nezapadá P220 Elite tieň. Nefunguje na nastaviteľnými mieridlami. Časť - Výrobcovia: MGW307 Bezpečne premiestni pevnú pamiatok vpravo alebo vľavo v ich firmu bez deformácii snímky alebo pohľad. Špeciálne navrhnutý pre použitie s factory a následnom trícia nočné pamiatky, ktoré sú príliš krehké na tradičné kladivo a punč pohľad spôsob inštalácie; funguje rovnako dobre s iron zameriavače. Thumbscrew bezpečne uzamkne snímku, tak je plne podporovaná v tuhé, obrábané hliníkové telo. Samostatné prevádzkové intervaly v skrutku mechanizmus zapojiť zrak a pevne, ale jemne, sústrediť skrutku sily k uvoľneniu pamiatok od aj extrémne tesný firmu. Kalenej ocele rukoväť poskytuje dostatok pákového efektu, zatiaľ čo já-mazacie, olejom impregnovaný Oilite® bronzové ložiská a extra jemné vlákna zabezpečiť hladké a presné pohybu. Beretta/Glock fit len zadné mieridlá. Glock byt strane zapadá aftermarket zadné mieridlá s rovnou a non-sloped stranách pre štandard - a veľké-rám pištole Glock. SIG vojde zadné mieridlá na všetky SIGs okrem SIG-PRO. Smith & Wesson M & P hodí oboch a predné a zadné zameriavače; nebude fit Pro modely s 5" barel. Nebude fit model štít. Smith & Wesson M & P štít teraz hodí 9,40 & 45 modelov. Springfield XD hodí predné a zadné zameriavače na vöetk˝ch XD okrem muška na 5" barel taktické model. Tieto práce na mušky Pro/taktické ani sub kompaktný model XD/XDM mušky. Nefunguje XD-S snímok. 1911 nebude fungovať väčšina Kimber slide/pohľad kombináciami. Funguje len na zadné mieridlá. Nie za inštaláciu alebo nastavenie mušky. SIG hodí P220, P225, P226, P228, iba P239. Nezapadá Sig Pro series. Nezapadá P220 Elite tieň. Nefunguje na nastaviteľnými mieridlami. Časť - Výrobcovia: MGW317 Bezpečne premiestni pevnú pamiatok vpravo alebo vľavo v ich firmu bez deformácii snímky alebo pohľad. Špeciálne navrhnutý pre použitie s factory a následnom trícia nočné pamiatky, ktoré sú príliš krehké na tradičné kladivo a punč pohľad spôsob inštalácie; funguje rovnako dobre s iron zameriavače. Thumbscrew bezpečne uzamkne snímku, tak je plne podporovaná v tuhé, obrábané hliníkové telo. Samostatné prevádzkové intervaly v skrutku mechanizmus zapojiť zrak a pevne, ale jemne, sústrediť skrutku sily k uvoľneniu pamiatok od aj extrémne tesný firmu. Kalenej ocele rukoväť poskytuje dostatok pákového efektu, zatiaľ čo já-mazacie, olejom impregnovaný Oilite® bronzové ložiská a extra jemné vlákna zabezpečiť hladké a presné pohybu. Beretta/Glock fit len zadné mieridlá. Glock byt strane zapadá aftermarket zadné mieridlá s rovnou a non-sloped stranách pre štandard - a veľké-rám pištole Glock. SIG vojde zadné mieridlá na všetky SIGs okrem SIG-PRO. Smith & Wesson M & P hodí oboch a predné a zadné zameriavače; nebude fit Pro modely s 5" barel. Nebude fit model štít. Smith & Wesson M & P štít teraz hodí 9,40 & 45 modelov. Springfield XD hodí predné a zadné zameriavače na vöetk˝ch XD okrem muška na 5" barel taktické model. Tieto práce na mušky Pro/taktické ani sub kompaktný model XD/XDM mušky. Nefunguje XD-S snímok. 1911 nebude fungovať väčšina Kimber slide/pohľad kombináciami. Funguje len na zadné mieridlá. Nie za inštaláciu alebo nastavenie mušky. SIG hodí P220, P225, P226, P228, iba P239. Nezapadá Sig Pro series. Nezapadá P220 Elite tieň. Nefunguje na nastaviteľnými mieridlami. Časť - Výrobcovia: MGW318 Bezpečne premiestni pevnú pamiatok vpravo alebo vľavo v ich firmu bez deformácii snímky alebo pohľad. Špeciálne navrhnutý pre použitie s factory a následnom trícia nočné pamiatky, ktoré sú príliš krehké na tradičné kladivo a punč pohľad spôsob inštalácie; funguje rovnako dobre s iron zameriavače. Thumbscrew bezpečne uzamkne snímku, tak je plne podporovaná v tuhé, obrábané hliníkové telo. Samostatné prevádzkové intervaly v skrutku mechanizmus zapojiť zrak a pevne, ale jemne, sústrediť skrutku sily k uvoľneniu pamiatok od aj extrémne tesný firmu. Kalenej ocele rukoväť poskytuje dostatok pákového efektu, zatiaľ čo já-mazacie, olejom impregnovaný Oilite® bronzové ložiská a extra jemné vlákna zabezpečiť hladké a presné pohybu. Beretta/Glock fit len zadné mieridlá. Glock byt strane zapadá aftermarket zadné mieridlá s rovnou a non-sloped stranách pre štandard - a veľké-rám pištole Glock. SIG vojde zadné mieridlá na všetky SIGs okrem SIG-PRO. Smith & Wesson M & P hodí oboch a predné a zadné zameriavače; nebude fit Pro modely s 5" barel. Nebude fit model štít. Smith & Wesson M & P štít teraz hodí 9,40 & 45 modelov. Springfield XD hodí predné a zadné zameriavače na vöetk˝ch XD okrem muška na 5" barel taktické model. Tieto práce na mušky Pro/taktické ani sub kompaktný model XD/XDM mušky. Nefunguje XD-S snímok. 1911 nebude fungovať väčšina Kimber slide/pohľad kombináciami. Funguje len na zadné mieridlá. Nie za inštaláciu alebo nastavenie mušky. SIG hodí P220, P225, P226, P228, iba P239. Nezapadá Sig Pro series. Nezapadá P220 Elite tieň. Nefunguje na nastaviteľnými mieridlami. Časť - Výrobcovia: MGW309S Bezpečne premiestni pevnú pamiatok vpravo alebo vľavo v ich firmu bez deformácii snímky alebo pohľad. Špeciálne navrhnutý pre použitie s factory a následnom trícia nočné pamiatky, ktoré sú príliš krehké na tradičné kladivo a punč pohľad spôsob inštalácie; funguje rovnako dobre s iron zameriavače. Thumbscrew bezpečne uzamkne snímku, tak je plne podporovaná v tuhé, obrábané hliníkové telo. Samostatné prevádzkové intervaly v skrutku mechanizmus zapojiť zrak a pevne, ale jemne, sústrediť skrutku sily k uvoľneniu pamiatok od aj extrémne tesný firmu. Kalenej ocele rukoväť poskytuje dostatok pákového efektu, zatiaľ čo já-mazacie, olejom impregnovaný Oilite® bronzové ložiská a extra jemné vlákna zabezpečiť hladké a presné pohybu. Beretta/Glock fit len zadné mieridlá. Glock byt strane zapadá aftermarket zadné mieridlá s rovnou a non-sloped stranách pre štandard - a veľké-rám pištole Glock. SIG vojde zadné mieridlá na všetky SIGs okrem SIG-PRO. Smith & Wesson M & P hodí oboch a predné a zadné zameriavače; nebude fit Pro modely s 5" barel. Nebude fit model štít. Smith & Wesson M & P štít teraz hodí 9,40 & 45 modelov. Springfield XD hodí predné a zadné zameriavače na vöetk˝ch XD okrem muška na 5" barel taktické model. Tieto práce na mušky Pro/taktické ani sub kompaktný model XD/XDM mušky. Nefunguje XD-S snímok. 1911 nebude fungovať väčšina Kimber slide/pohľad kombináciami. Funguje len na zadné mieridlá. Nie za inštaláciu alebo nastavenie mušky. SIG hodí P220, P225, P226, P228, iba P239. Nezapadá Sig Pro series. Nezapadá P220 Elite tieň. Nefunguje na nastaviteľnými mieridlami. Časť - Výrobcovia: MGW319 Bezpečne premiestni pevnú pamiatok vpravo alebo vľavo v ich firmu bez deformácii snímky alebo pohľad. Špeciálne navrhnutý pre použitie s factory a následnom trícia nočné pamiatky, ktoré sú príliš krehké na tradičné kladivo a punč pohľad spôsob inštalácie; funguje rovnako dobre s iron zameriavače. Thumbscrew bezpečne uzamkne snímku, tak je plne podporovaná v tuhé, obrábané hliníkové telo. Samostatné prevádzkové intervaly v skrutku mechanizmus zapojiť zrak a pevne, ale jemne, sústrediť skrutku sily k uvoľneniu pamiatok od aj extrémne tesný firmu. Kalenej ocele rukoväť poskytuje dostatok pákového efektu, zatiaľ čo já-mazacie, olejom impregnovaný Oilite® bronzové ložiská a extra jemné vlákna zabezpečiť hladké a presné pohybu. Beretta/Glock fit len zadné mieridlá. Glock byt strane zapadá aftermarket zadné mieridlá s rovnou a non-sloped stranách pre štandard - a veľké-rám pištole Glock. SIG vojde zadné mieridlá na všetky SIGs okrem SIG-PRO. Smith & Wesson M & P hodí oboch a predné a zadné zameriavače; nebude fit Pro modely s 5" barel. Nebude fit model štít. Smith & Wesson M & P štít teraz hodí 9,40 & 45 modelov. Springfield XD hodí predné a zadné zameriavače na vöetk˝ch XD okrem muška na 5" barel taktické model. Tieto práce na mušky Pro/taktické ani sub kompaktný model XD/XDM mušky. Nefunguje XD-S snímok. 1911 nebude fungovať väčšina Kimber slide/pohľad kombináciami. Funguje len na zadné mieridlá. Nie za inštaláciu alebo nastavenie mušky. SIG hodí P220, P225, P226, P228, iba P239. Nezapadá Sig Pro series. Nezapadá P220 Elite tieň. Nefunguje na nastaviteľnými mieridlami.